A close up of the Dwight D. Eisenhower Presidential $1 Coin shows that the edge lettering is not uniformly placed or in the same direction for each coin due to how they fall into the incusing machine. The coins are minted in Denver. Did you know that the edge lettering orientation is random on uncirculated Presidential $1 coins because the edge lettering is performed after the coin is struck? 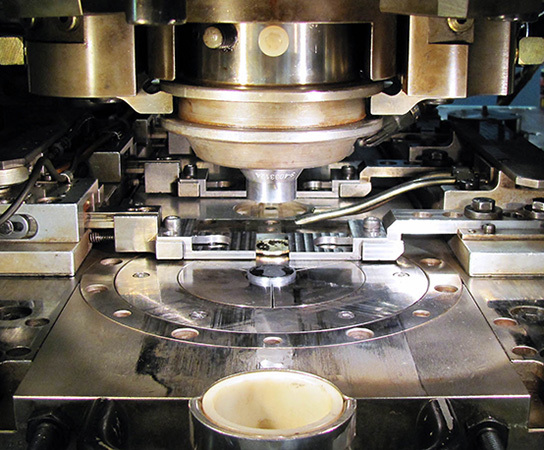 That is because the coin’s orientation is random as it is fed into the edge lettering machine, even though the edge-lettering machine is directly fed by the press. 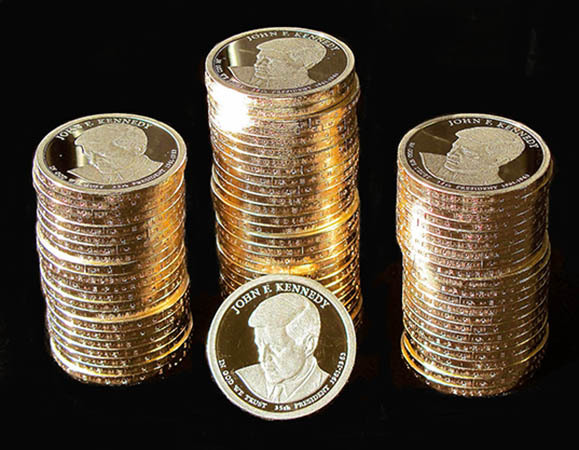 On proof coins, the edge lettering is integrated into the stamping process by using a 3-piece stamping collar with edge lettering as a part of the collar. The collar is in three sections to that it can expand when the coin is ejected. Otherwise the lettering would be torn during coin ejection. In this process the obverse, reverse and edge lettering are all formed during the striking of the coin and are therefore oriented the same from coin to coin. There is no edge lettering machine used on proof coins.